Mayor Steve Hagerty sits in his office. One year into his first term, Hagerty said he is fully realizing the “all-encompassing” nature of his job. 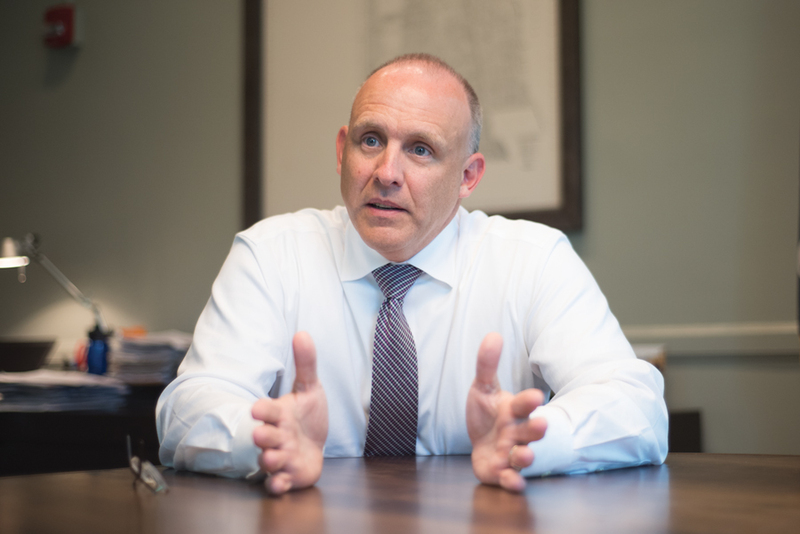 More than a year after taking office, Mayor Steve Hagerty said he is fully realizing the “all-encompassing” nature of his job. From overseeing City Council meetings to focusing on the city’s finances and interacting with residents from all walks of life, Hagerty said his tenure has been a “very rich experience” so far. Assuming the position of mayor is Hagerty’s first foray into elected office. He narrowly won the mayoral election in April 2017 — finishing only 115 votes ahead of his opponent, former 6th Ward alderman Mark Tendam. He ran on a platform focused on strengthening the city’s economy and youth development, as well as placing an emphasis on affordable housing. Hagerty’s background is in emergency consulting: He founded an Evanston-based crisis management firm that specializes in helping communities recover from disasters like the 9/11 attacks, Hurricane Katrina and Superstorm Sandy. His experience in the field translated well to his role as mayor, which similarly combines managerial tasks with community outreach, he said. And in crisis situations, Hagerty said, his experience allows him to ask the right questions at the right time. After Northwestern’s campus went on lockdown for about two hours in March due to reports of an active shooter on campus — a fabricated incident that was later determined to be a “swatting” hoax — Hagerty said he was able to apply his crisis management skills when analyzing and debriefing the hoax with city officials and University administrators. Beyond individual emergency situations, Hagerty said he tries to be approachable in his role — both for residents and city staff. As mayor, he said he has come to appreciate the “human dynamics” of Evanston and the particular viewpoint his role has afforded him. The mayor works in tandem with Evanston’s city manager, Wally Bobkiewicz, who oversees Evanston’s day-to-day operations. Bobkiewicz said he appreciates Hagerty’s “unique qualifications” for the job and his deep understanding of how cities work. Evanston has also faced budget issues of its own. In December, City Council passed the city’s operating budget for Fiscal Year 2018, which had to account for a nearly $6 million deficit. Looking ahead to the 2019 budget, Bobkiewicz said he is estimating another deficit of at least $3 million. Because of this, city staff have already begun to reach out to residents for input on potential program cuts across city departments through a system of priority-based budgeting. Hagerty said the budget and improving Evanston’s overall financial situation are his priorities. His managerial experience, he said, has given him a set of tools with which to approach fiscal issues in the city — as well as a necessary decisiveness. Evanston prides itself on robust programs and services for its residents, Hagerty said. But ultimately, “all of this costs money” and the city must ensure it’s financially sound to be able to fund them. He said that as mayor, he meets with residents who contribute to the city through service work, activism and regular attendance at city meetings. Hagerty added that public comment during council and committee meetings often draws a long list of speakers who bring opinions on practically all the issues voted on by aldermen. Over the past year, Hagerty said he has noticed that residents are increasingly voicing their frustrations with decisions made locally, in Illinois and on a federal level. When aldermen narrowly approved the construction of a 15-story apartment building on Sherman Avenue in November, Hagerty said he remembers a packed council chamber filled with frustrated residents. In total, 82 had signed up for public comment, and Hagerty said he had to figure out how to give them all time to speak in the 45 minutes allowed according to the City Code — which amounted to only 30 seconds per person. He said it was important to him that every resident be given the time to voice their concerns, actively participate in government and engage with their elected officials. He added that he gave “a lot of thought” to the structure of citizen comment that night, and it reflected how he wants to run city meetings going forward. Ald. Eleanor Revelle (7th) said she appreciates Hagerty’s receptiveness to residents and aldermen alike. She said he is always willing to hear out issues she or her colleagues want to discuss. Setting the tone has been important from the beginning of his term, Hagerty said, especially considering the divisive rhetoric coming from the Trump administration. He said he wants to be approachable to community members and make them feel like they can come to him with issues of any kind and work toward a solution. He said he prides himself on being an “honest broker” and making sure to listen to individuals.